← Liar, liar, fur on fire! Never underestimate the power of leverage on a horse’s head. A recent Facebook post, by a trainer recognized by many as upholding classical standards, showed the power leverage can have. The post was regarding a young mare and her transformation over a few short lessons. The mare traveled in an inverted fashion under her somewhat green rider. A change from her snaffle to a straight pelham led to a total transformation in her carriage. The rider had not changed, but the horse had. Such is the power of applying leverage to a horse’s head. I am of mixed feelings about this particular case, but with my own Roxie I am dealing with the fallout of relying upon such leverage without building a proper foundation. 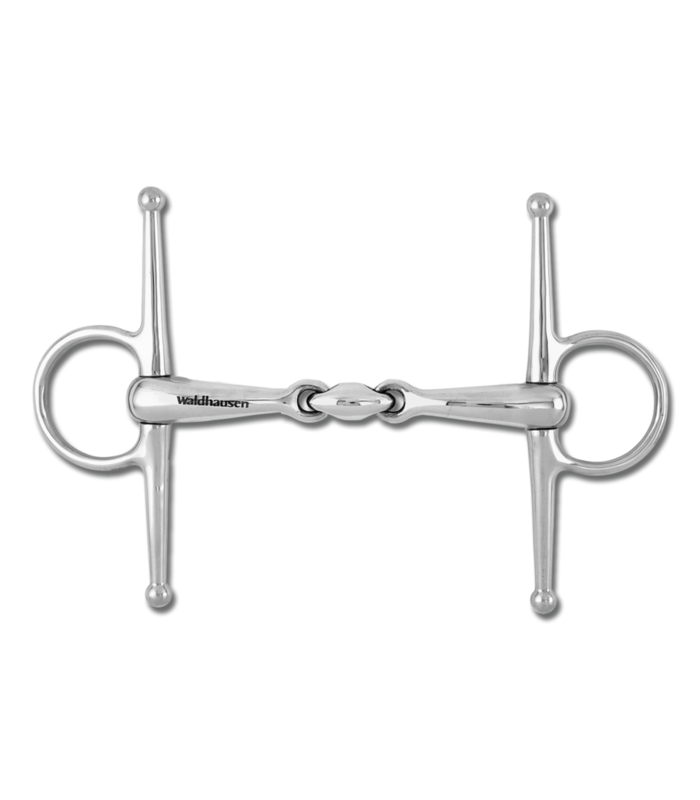 The opening example aside, traditionally a leverage bit is used on a “finished” horse, one started in a snaffle. 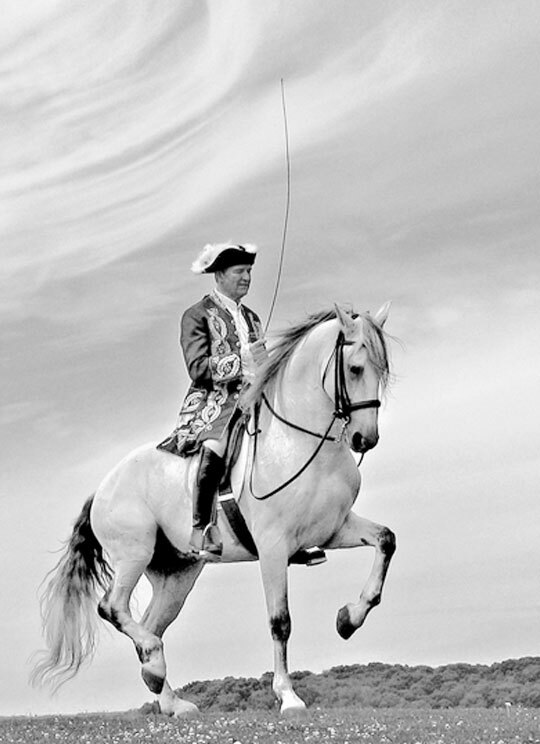 In the truly classical tradition, the horse was often started in a cavesson only (i.e., bitless) and transitioned to a leverage bit (curb) when balance, collection, obedience, and true lightness of aids were achieved. Many disciplines use leverage bits. 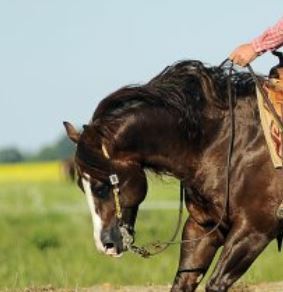 Western horses work in a curb bit, but the contact is light – usually with a loop in the rein. Historically the curb is ridden one handed, as its construction and function do not lend themselves to single-rein use. Even with the double bridle, used in Dressage competition, the traditional holds usually involved the curb reins in one hand with the other hand holding only the second snaffle rein. Leverage: the action of a lever or the mechanical advantage gained by it. The model bit I used in the last couple of years of Ben’s jumping career. I first experienced the power of leverage many years ago, when my hunter trainer became tired of playing Ben’s game of “carry my head”. Ben’s flat work was fine, but he knew that you could do little in the last couple of strides to the fence, and that’s when you would suddenly find you were carrying an extra fifty pounds in your hands. She put him in a Tom Thumb pelham, and suddenly my hunter stayed light throughout the course. What I also noticed was that if I did not stay very light in my hands, Ben became too light and backed off contact all together. Proof that you can have too much of a “good” thing – and that was a short shanked bit. The style of bit Roxie wore in our first ride. This brings me to my first ride on Roxie. The bit she was ridden in, also called a Tom Thumb, amounts to a broken mouthed curb bit. I’ll admit to being a bit perplexed at how to ride with this bit. 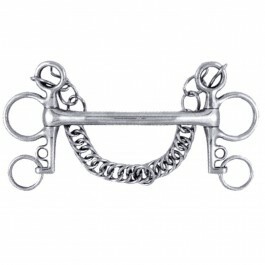 English leverage bits with jointed mouth pieces generally have two reins – one attached similar to a snaffle, the other on the bottom ring for leverage. With skill, you can choose to use a single rein as on a snaffle, or use both reins for the leverage effect. The bit Roxie wore had no such options. Flashing back to my test ride on Coffee, where even my looped reins were deemed “too much contact”, I opted for the loose rein approach with Roxie. Much to my surprise, her trainer told me, “She’s wanting you to take more contact.” This went against everything I knew about leverage bits, but I took up just enough rein so they no longer appeared loose. During the trainer’s ride and my own, Roxie carried herself in an attractive way. From the ground, one might easily judge it to be a middle level Dressage frame. However, once on her back, it was clear there was a lot missing from what one would expect from such a frame. There was little discernable movement in the back, and only the amount of drive from behind that nature had granted her. The style of bit Roxie now goes in. Fast forward to this year, when I’m finally back in the saddle. Her balance has improved on the lunge line, and her movement is beginning to show more drive and is starting to swing through the back. But the first thing I notice under saddle is that she has no idea what to do with the bit. Where she was soft, with an arched neck, in the leverage bit; now she locks and braces at the lightest touch on the snaffle rein. Therein lies the deception of the leverage bit. It’s action is on multiple points on the horse’s head, and they learn pretty quickly how to react to the pressure on the poll in order to avoid the pressure on the mouth. If you’re riding Western Pleasure, or any discipline that entails mainly going round the rail of an arena, this probably serves you well enough. 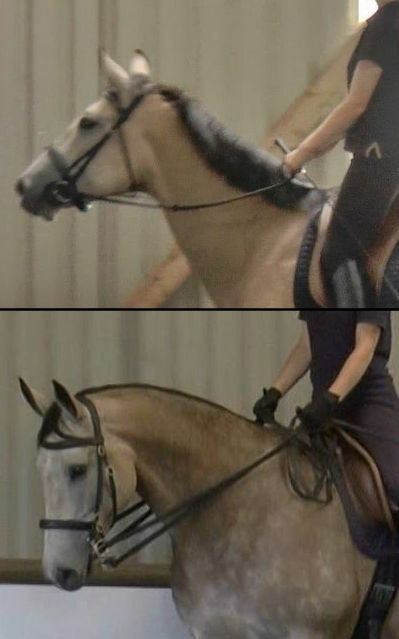 But a Dressage rider needs many variations on rein aids – mostly very subtle ones, in the way that I ride. The truly classical double – cavesson (dropped rein) and curb held in one hand. So begins the reeducation of Roxie. I could easily speed part of the process by going to a leverage bit, and I would again have a soft feel and arched neck. But my current experience with her shows the lack of education that can occur when you take such a short cut. For the trainer mentioned in my opening, she may take the time to ensure the education of that mare. The use of a leverage bit is not, in and of itself, a negative. However, knowing that I cannot be sure when a response is from understanding or when it’s from simple avoidance of the leverage, I’m much happier sticking with my snaffle. Someday we may return to a leverage bit, but only if we can do it in the classical tradition. This entry was posted in My Journey and tagged bits, curb bits, horsemanship, leverage bits, Roxie. Bookmark the permalink. 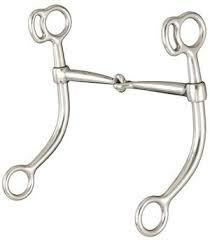 As a dressage rider at the Prix St. George level I do use a double bridle with snaffle( bridoon) and curb bits. I do not use this every day and always start the week in a snaffle with an almond at the center. I do not do the three in one rein hold but have both reins in both hands. The snaffle rein is held with my ring finger and the curb with my middle finger. This way the snaffle is the most used bit. Most of the dressage riders I know use this method but occasionally when my coach asks for it I have used the three in one. Nice post and very informative showing the bits and their uses. Nice to hear, Anne. Most riders I knew only schooled in the double occasionally, but I’ve heard of more now who use it mostly, which I think can become a crutch. Even read a piece where one famous trainer thinks it should be allowed as low as second level, which seems to me to miss the point all together. I admit that the three-in-one hold was never taught when I was learning, but was something I learned much later. In fact, I was surprised at how many holds there are! Double for 2nd level? Yipes! I don’t know why that would be necessary considering the requirements for the frame, collection etc at that level. On the flip side there are some top riders who campaign for allowing the snaffle to be ridden for the Grand Prix. Another hold I’ve seen used , but not in competition, is the Filius rein. I’m not any good with that one as I tend to lock my wrists with it. Thanks for your reply to my comment. Lots of interesting points of view about bits and their uses. The justification for double at the lower levels was that it made that it would make it easier for young and amateur riders to collect their horses … a bit backwards to my mind, since the curb should come in once the horse already has achieved collection, not as a way to develop it. Bits always make for interesting discussion! I agree with you. I once had a coach who talked about “razor blades in the hands of monkeys.”. Bit extreme but I knew what she meant.